A review of Skinny Girl popcorn including nutrition and how it can make a great low-calorie snack. I love popcorn! It is an easy to make snack that is fairly healthy and always a fun treat to have. Some brands of popcorn are high in calories and fat due to the excessive amounts of butter or sugar added. I recently had the opportunity to try the new Skinnygirl popcorn which is a low calorie popcorn. I tried both the lime and salt and butter and sea salt flavors. I couldn't wait to especially try the lime & salt flavor since I had never had one like that before. This product comes in a box of 10 mini bags that makes portion control so much easier than eating from a big bag which I loved. One cup of the popcorn has only 25 calories which is quite low. Skinnygirl popcorn has about 20% less calories than other brands of popcorn making it a great low-calorie snack. What I really like about this popcorn is that it can easily be eaten on the go. If I was on the run somewhere, I could easily throw this in the microwave for about 1 1/2 minutes and have a tasty snack ready to go. I would pair it with a stick of string cheese, pistachios, a piece of fruit and some veggie sticks for a healthy meal on-the-go. As a dietitian, I enjoy eating healthy foods most of the time but of course, like to splurge as well. I believe that life is all about balance. With Skinnygirl popcorn, I can have a treat that is also healthy which is awesome. It contains no artificial colors, flavors, sweeteners or high fructose corn syrup. I love the lime and salt flavor. I popped a bag of this for my husband and I and we both really enjoyed it. The lime flavor is not too strong but definitely prominent enough. It is great on its own or with chili powder added for a chili-lime popcorn. We were not that hungry and could split one bag between the two of us. I was glad that my husband enjoyed it also since it was a healthier snack choice. Maybe he can replace some of his late-night chip sessions with some of this lighter popcorn? The butter and sea salt flavor was also great. I think of butter popcorn as a blank canvas that you can add all sorts of flavors too. The possibilities are endless- parmesan and garlic, cinnamon apple, caramel, etc. This popcorn is very good in a trail mix as well as popcorn is a low-calorie option to add to trail mix. 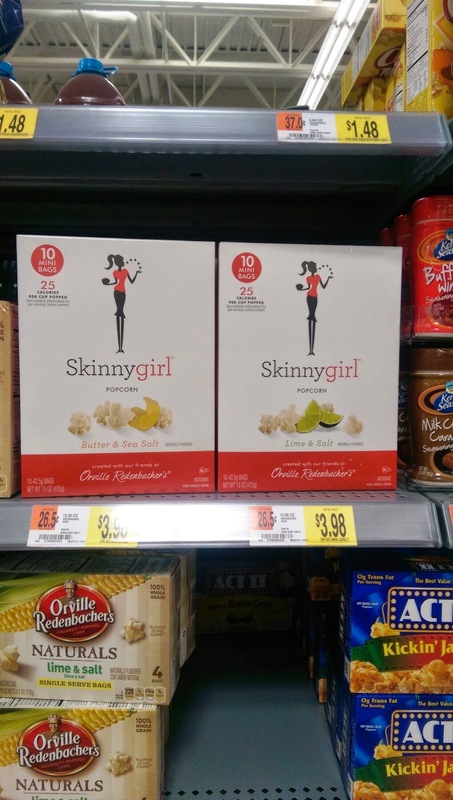 Skinnygirl popcorn can be found at Walmart with the rest of the popcorn. My sister comes over a lot to hang out, watch movies, etc. and this would be a great snack for a ladies night since it is low in calories and flavorful. This way, you can indulge in snacks without the guilt. It would be great with a low-calorie beverage such as iced tea or a Skinnygirl cocktail. It is not always the calories that people should focus on. Skinny girl popcorn seems a bit high in sodium which makes me bloated. Skinny pop is a healthier alternative that is also gluten free but also cholesterol free, peanut free, dairy free and transfat free. Also, significantly lower in sodium.